While high resolutions, ultra-wide aspect ratios, and curved panels are all the rage for monitor upgrades these days, the demand for more standard 1080p panels remains high. After all, it's still a challenging resolution for today's graphics cards, especially if you're chasing smooth frame rates in modern AAA titles. It's also much easier to hit the very high frame rates that many esports players demand if you limit your resolution. Lastly, they're often simply far cheaper, something evidenced by this, the £135 Iiyama G-Master G2530HSU-B1. As will be seen, this is a fairly basic monitor in most regards, but it does have a few tricks up its sleeves, namely a 75Hz maximum refresh rate and support for AMD FreeSync. 15Hz higher than the usual 60Hz isn't a lot, but it's still nice to see, and FreeSync is absolutely a bonus. At £135, it really lives up to its name as well; Nvidia places tighter regulations on what can be a G-Sync monitor, but the fact is you'll be paying upwards of £300 at a minimum to get a monitor with variable refresh rate support if you use the green team's hardware. The G2530HSU gives you a 24.5” viewing area for its 1,920 x 1,080 resolution. Most specifications are fairly by the books for a TN panel, although the 1ms promised response time is a further indication that this is mainly a screen for gamers. 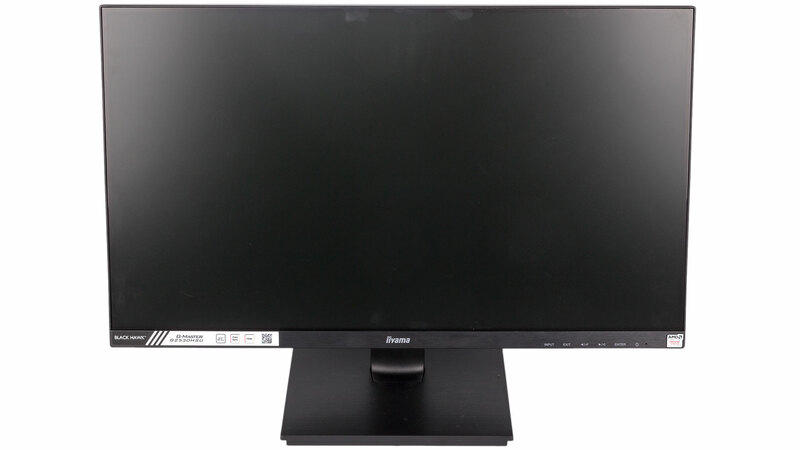 The monitor itself is smart looking with a very minimal plastic border around the screen at the top and sides, although there is a thin, black, in-panel border around the viewing area as well. Along the bottom is a plastic section with a brushed metal finish that's matched by the base. The screen only takes a few moments to construct; the stand slides into the monitor and is then attached at the bottom to the base with a single thumbscrew. Physical adjustments are sadly limited to tilt only (up to 5° forward, up to 22° backward), and this is made more annoying by how close to the base the screen sits; it feels sorely lacking in height. You can, at least, use the VESA wall-mounting system, but this seems like it will be a niche market for budget screen shoppers. All ports at the back are down-facing, and this includes the two USB ports and headphone/audio out jack. The USB hub only meets the 2.0 standard as well, so we can't see it getting much use at all. VGA, HDMI, and DisplayPort inputs should cover most users (HDMI is the only display cable supplied), although DVI in place of VGA would have been better in our opinion. Dual 2W speakers are built into the screen, but the less said about them, the better. Both HDMI and DisplayPort are FreeSync-compatible between 48Hz and 75Hz, which isn't a big enough range to support Low Framerate Compensation. As such, below 48fps, FreeSync won't work. Still, it's hard to hold this against the G2530HSU too much given its cost, and we're still happy it has FreeSync at all. Iiyama's menu system isn't the easiest in the world, but it gets the job done. There are six buttons in all: five for navigation, one for power. Front-facing symbols give some indication as to what they do, but you might make a few mistakes as you get used to it. There are various image and colour control options, including Eco mode, blue light reduction, and black tuner, which is a featured aimed at gamers for bringing out details in dark areas. You can also choose custom overdrive settings, with five levels between -2 and 2 available – 0 is the default. FreeSync is buried in the setup menu and off by default. There are three gamma presets – 1.8, 2.2, and 2.6 – with 2.2 thankfully being the out-of-box setting. For colour settings, the default option is the user-customisable one where all three RGB values are set to 100, but you also get Cool, Warm, and Normal options to play with. Lastly, Iiyama includes its i-Style picture options (and the 'Exit' button provides quick access) which are designed for the activities they're named after: Sport, FPS, Strategy, and Text, for example. You can also save up to three user profiles. In short, it's a standard feature suite accessible in an uninspiring but functional menu structure.